First, thanks for all the help. This site has been very helpful over the years. 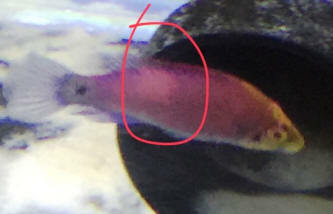 My question is in regards to my Mystery Wrasse. I’ve had the fish for 3 months now, it a 55 gallon quarantine tank, with no medication yet, along with a Flame Hawkfish. 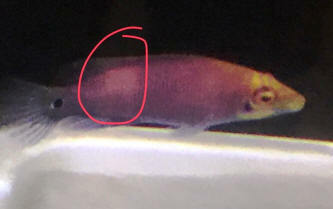 I noticed on the flank, closer to the tail, the Mystery Wrasse has a small area of “discolouration”, not white or fuzzy, but like a small patch of new skin/brighter skin than the rest of the fish’s body. Any idea of what this could be? Is this something normal? The Wrasse is eating well, being fed krill/Mysis shrimp soaked in Selcon. He’s swimming well, not scratching and hasn’t exhibited any abnormal behaviours. The only thing I can think of is that 4 days ago when I added the Flame Hawkfish; the Wrasse did show some curiosity and aggression and the two fish did take some nips at each other. They now completely ignore each other, even when in close proximity...they sleep in the same PVC pipe lol. I’m going to start my normal prophylactic quarantine procedure with Praziquantel (PraziPro) followed by Cupramine; but would like to know what your thoughts are before I proceed. I’ll try to get a picture, but it’s proving pretty difficult to see in the pics! Thanks Bob! I know your right, and it’s probably nothing to worry about but I’ve attached pictures just for you to see and for the site if you want to post them for anyone else in the future. Let me know if you still believe it’s nothing to worry about. MACNA in Vegas is a bucket list event for me! Sounds amazing. Yeah, these little red beauties can be mean! I’m pretty sure that’s where the Wrasse took a nip from the little flame. Thanks again Bob and Team! are extremely aggressive (I get the impression from reading that they vary in their temperament). He says the four lined wrasse is much more peaceful (although a lot more expensive!) 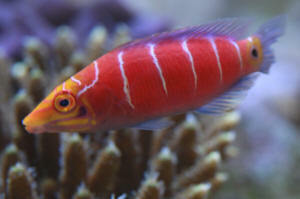 Do you agree that the four lined wrasse is a better bet if I want to preserve the safety and sanity of my other fish? Also, I know these wrasses bury themselves at night. I currently have a rather shallow bed of sand in the tank. How many inches of sand would be needed for these wrasses? And my quarantine tank has no sand, of course. Would it be too stressful for one of these fish to spend a month in quarantine, with no sand? Hope your having a good night Bob. I have a few questions for you tonight involving a pair of Sixline wrasse I have in my 40G breeder tank. When I bought them they were in the same tank and I watched them for about 20 minutes and saw zero chasing nor any aggression between them and decided to buy them hoping they might be a bonded pair. The larger one is about 2 1/2-3 inches and the smaller one about 1 1/2-2 inches and they have been in there together for about 3 weeks. There still is no aggression nor any chasing and they often swim near each other. two large peppermint shrimp, some Xenia, some mushrooms, Tongue coral, and some Duncan's. There is also zero aggression between the wrasses and the Angel. Do you think they may be a pair and stay relatively peaceful towards one another or do you think they will eventually fight with one another? Do you think removing the Angel could change the dynamics between the wrasses? After removing the Angel I would like to add something else but don't want to chance changing the dynamics between the two Sixlines, any thoughts? and a 2 1/2 inch Ctenochaetus binotatus in separate quarantine tanks right now. Do you think the Singapore Angel, juvenile red Coris wrasse, and Ctenochaetus binotatus would be ok together in a 55G until I set up the 6ft 135G I have in the garage or should I leave in quarantine until the 135G is setup which might take up to 6 months from now? Thanks for the reply Gabe! I really do enjoy reading the website and learning, just ask my wife. You are correct that is was never my intention to put the Red Coris in the 40 due to their eventual size and the fact they would eat what I have in the tank. Based off of your comment about the tang do you think it would be ok in the 40 at least till I make room in one of my 75g if not long term, I know 40 is small when it comes to tangs. I can't really move the Singapore right now as it was originally intended for the 75g till the 135 could be setup but the Powder Blue Tang that is in there didn't take too kindly to his presence which isn't unexpected and I'm not sure the Singapore is big enough at 3 inches for the 5-6 inch Rhinopias that is in my other 75G. I know some of the animals I have are in too small of a tank but IME they should be fine in the short term and took advantage of acquiring healthy individuals. I recently had to take my 6 line wrasse out of my main tank as he was attacking new clownfish arrivals. It took tons of work and removal of my live rock to catch him. Now that I have the wrasse in a separate tank he has hidden himself in a piece of live rock I put in there for him and he won't come out! <Also to It's been 3 whole days and he won't eat or come out of his hiding place. He is still alive and I know he is traumatized but do you think he'll ever come out and start eating again or is he a goner! Thank you for your time and your reply! I was informed that the Mystery Wrasse () which origins from Marshall Island or Hawaii looks different from those that is found in Vanuatu. Those from Hawaii/Marshall Island are more purplish in colour from juvenile till adult but will lose its bar as it grows old. However, those from Vanuatu are more pinkish in colour and the bar will stay throughout its growth. Is there any where I could read up more about them? my answer. I have attached the picture of 1 from Hawaii and another 1 from Vanuatu. Peppermint shrimp to rid Aiptasia ? Or feed a wrasse? - 2/4/2006 Hello to the crew ! I have a relatively simple 50 gallon reef, which has slowly been over run with Aiptasia. I went to my LFS and was told peppermint shrimp should do the trick, so I purchased three of them. The following day I looked for them and they are no where to be found ? <Maybe> I'm wondering what could have happened to them. I only have two fish, one being a yellow tang and the other a six-line wrasse. <The last could have consumed them> Do either of these fish have shrimp on the menu ? <Yep> I also lost a cleaner shrimp about two months ago, which I had for approximately one year. One day he was there, the next gone. Any clues ? What about the possibility of a bristle worm ? If one of these guys is the culprit, what is the best way to deal with my quickly spreading Aiptasia problem ? <See WWM re... Bob Fenner> Thanks for the input. Trever from Santa Barbara, Ca.